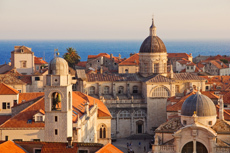 Dubrovnik is a great walking city for culture and history lovers as it is filled with centuries-old monasteries, churches, synagogues and even one of the oldest operating pharmacies in Europe. It's also a gorgeous spot to simply sit and watch the world go by amid red-roofed stone buildings and the sparkling, aqua Adriatic Sea. Upon arriving in port we boarded a tour bus for a scenic drive to an overlook and panoramic view of Dubrovnik. We returned to Old Town through the historic Pile Gate and a walking tour of that area. Disappointed only because strong winds forced cancellation of our optional cable car tours. Dubrovnik tour was very good. Dubrovnik tour was very good. Anywhere in Dubrovnik it cost money to use a restroom and not all took Euro - we had to switch money to Kuno. We did the walking tour of the walls on our own - cost of admission was $46.29 for 2 American. The city was very cool. The city was very cool. A lot of walking uphill and stairs. We went to a family estate in the countryside and had lunch. It was very good and quite interesting. Beautiful tour of a fascinating and historic place... The walled old city is perfect for exploring and walking about. We went on a Game of Thrones filming location tour! Dubrovnik the jewel in the crown. Dubrovnik the jewel in the crown. Quick walk or taxi to the town centre the old town in its walls is very scenic. Felt safe here nice place visited lots of shops. Free shuttle bus back to ship. Thoroughly enjoyed the walking tour and opportunity to stay in the area and explore on our own, Buses were available at any time to take us back to ship. The weather was perfect which influenced our choice of Dubrovnik as our favorite stop. Seemed a bit rushed and superficial. Loved the Old Town. Many great photo opportunities. Location for filming of Game of Thrones and latest Star Wars movie, so lots of shops cater to these fans. Walked through old town with a radio guide. Walked through old town with a radio guide. The radio was hardly useable, unfortunately, so we just turned them off and followed the group. Very crowded here, but that&apos;s to be expected. Pretty interesting tour of Dubrovnik, beautiful scenery, lovely architecture, but the same old, same old walking tour. Not enough time to do thanything tour and mosey into shops. Actually a revisit for us, but still breath taking. Actually a revisit for us, but still breath taking. Walking in an ancient city surrounded by walls, like a castle. Recommend the wall walk (we did it previously). Saw much GAME OF THRONE scenary. On our second visit to Dubrovnik, we took the included walking tour which provided a good tour of the historical walled city. What a unique and beautiful place! What a unique and beautiful place! Be sure to use your free time to walk the walls of this ancient city. Sample some food and imagine living here, right in the middle of so much history! The walls were closed before we got there and our tour operator failed to let us know that there was a time limit. Good tour. Also met some of the locals at their farm. Vegetables were huge and still doing well in mid-October. The tour was rather rushed. The tour was rather rushed. The tour guide was excellent but it would have been better if we had head sets to hear her.